Bawendi and former MIT research scientist Oliver Bruns are the senior authors of the study, which appears in the Proceedings of the National Academy of Sciences. The paper's lead authors are MIT graduate students Jessica Carr and Daniel Franke. The MIT team discovered ICG's usefulness for SWIR imaging somewhat serendipitously. As part of a control experiment for another paper, they tested the fluorescence output of quantum dots against the fluorescence output of ICG in the short-wave infrared. They expected that ICG would have no output, but were surprised to discover that it actually produced a very strong signal. Bawendi's lab and other researchers have been interested in developing fluorophores for SWIR imaging because SWIR offers better contrast and clarity than NIR. Light with shorter wavelengths tends to scatter off of imperfections in objects that it strikes, but as wavelengths become longer, scattering is greatly reduced. 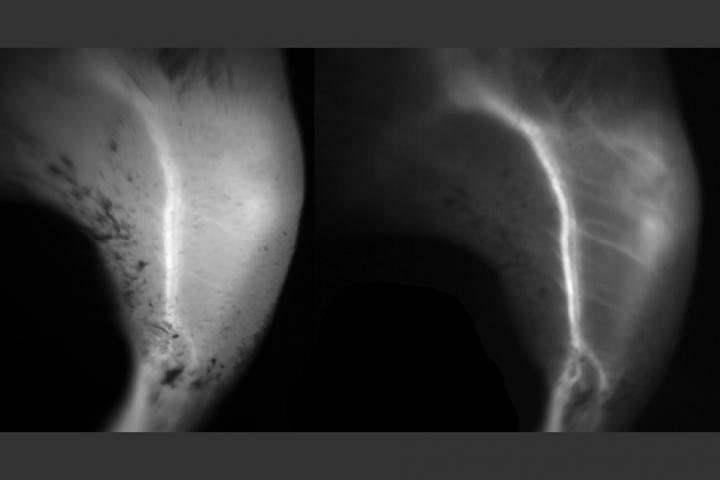 "We found that short-wave infrared is particularly useful for imaging small objects that are on top of a large background, so when you want to do angiography of small vessels, or capillaries, that's significantly easier in the short-wave infrared than in the near-infrared," Franke says. In their study, the researchers further explored ICG and showed that it gives a stronger signal than other SWIR dyes now in development. Previous studies of ICG had focused on its emission around 800 nanometers, where it fluoresces the brightest, so no one had observed that the dye also produced a strong signal at longer wavelengths. Though it doesn't fluoresce efficiently in the shortwave-infrared range, ICG absorbs so much light that if even a small percentage is emitted as fluorescent light, the signal is brighter than that produced by other SWIR dyes. "If you don't have a strong enough signal, it slows down how long it takes to take the image, so you can't use it for imaging motion such as blood flowing or the heart beating," Carr says.